Sloan’s big bed arrived two weeks ago and I was sewing the binding on this quilt the night before. The photos aren’t terrific, but I took a few close ups that are posted on Flickr. The pattern is based on “The Burbs” from the Material Obsession book. I found this quilt taught me a lot about myself. I struggled with the fact there is no set “rules” or “pattern” for this quilt. 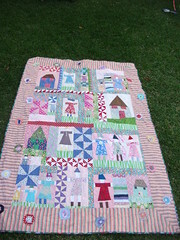 You start with making the doll and house blocks, then you need to pick fabrics and blocks to fill it in and bring the quilt together. I learned so much from making this quilt and I feel like I really grew in understanding different elements of design. Right now I have a baby girl quilt to make. I am struggling for ideas and flirting with making a small version of this one. My girlfriend who had the baby is anti pink which makes it a bit more of a challenge. Will have to see what I can rustle up. Over the school holidays the kids and I finally made this giraffe. I bought the Homespun magazine with this pattern in February of 2009. This one was made of flannel I bought at Spotlight in a pinch. 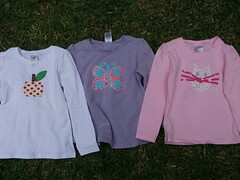 The pattern is from the lovely Fiona at Hop Skip and Jump and is such an easy, fun pattern to follow. The down side was I think I used some inferior fabrics and I wish I had known where to find some more substantial fabrics that make investing the time to make your own special toy really worthwhile. Fiona graciously emailed me a few suggestions and then I stumbled upon the most gorgeous mustard yellow wool at Material Obsession. Too late for this round, but next time for sure. If you are interested in lovely wool, Material Obsession has broken out some lovely wools for winter. 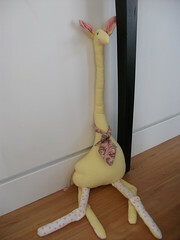 This giraffe was for Sloan and she has loved it silly already. The neck is a little worse for wear post so much 3 year old love. I will post some photos of the other two I made with some felt from Spotlight when I can locate them again. My parents were out visiting and helped “hide” them from Sloan and now I can’t find them. Will post more photos when I locate them in my own zoo! I bought a few plain t-shirts from Target for Sloan’s days at preschool. I wanted something that I wouldn’t get too heart broken if they get covered in paint and destroyed on the playground. The shirts were about $6 and I used all the fabrics I had on hand. I came up with a few designs with the help of my little friend and got these ready for the cold weather if it ever arrives. Not that I am complaining that it is still beach weather in April! There are a few more close ups of the shirts on Flickr. One more day until school starts. I can’t believe we are heading into term 2 already. I also finished Sloan’s quilt and will have to post a few photos up on Flickr this week. It took me almost a year to start this project and once I started I can’t believe I procrastinated for so long. 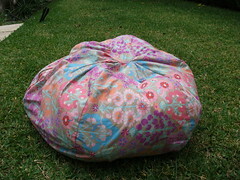 I used a free tutorial on the net to make this beanbag. Super easy, but takes a bit of fabric. The print is a Kaffe Fasset and it is a bit more Easter egg than I thought it would be. One of the drawbacks when buying online and not seeing the fabric. Regardless of the Easter colors, the recipient is excited to finally be in possession of the beanbag. No more fights hopefully now that we have two or is that too much to ask during school holidays?